Degrees and kids and birds and SUMMER (7qt) | House Unseen. Life Unscripted. This morning I peeled myself out from between my toasty warm child sandwich. Or was it a mom sandwich? Mom sandwich with kid bread. Yeah, that's what it was. So the filling peeled herself out of bed into the silent, chilly house and went to check the temperature on ye olde atomic clock that hangs in the dining room. But wait. What's that little mark there in front of the 12? A MINUS SIGN, PEOPLE. Negative twelve degrees. Honestly...if my kids didn't love going to co-op so much, I woulda thrown in the towel right then. But not literally because a towel can also be used as a small makeshift blanket and at that point I needed all the help I could get. Thankfully March starts tomorrow so when I wake up in the morning, the six foot tall piles of snow flanking our driveway will be completely melted. Whew! Such a relief. "St. Cecilia was from Italy. She is the patron saint of music. One day she wanted to get a pet cat and went to the pet store but they only had tigers and the tigers tore her clothes and she saw a sign and the sign said 'no kittens. only tigers.' But then St. Paul came and was like 'the kittens are in the next aisle.' Theeeeeeeeeee eeeeeeeeeeeeeeeeeend." Hey, the bird feeders from yesterday are working! When we got home from co-op, a black capped chickadee was hanging from the piece of bread, pecking crumbs off. By the time we finished eating lunch, a pair of tufted titmice (not EVEN making up that name) had joined her. And by 4 p.m., Katie had made a list of five different varieties of birds that had come to pay our little tree a visit. I should wish I would've gotten a photo of her with her two field guides and a notepad and pencil, but instead I fell asleep on the couch, which was, I'll be honest, so much better. So look at picture of a bird. If you live in the cursed north or midwest or northeast or pretty much anywhere north of Tennesee, I'm guessing you're running out of indoor entertainment for your kids. If you're not, write a winter survival book for us, okay? If you are, try an enormous roll of paper from Amazon. I may have gone a leeeeeeeeeeettle bit overboard with ours, which is 4 feet wide and and 200 feet long, but holy cow do the kids think it is amazing. You can lie down on it and trace an entire body (violent crime scene recreation, anyone?) or a make a huge wall timeline or a removable mural or draw roads and train tracks on which to drive small to medium sized vehicles on or...you get where I'm going with this. Skip to compensate for above not-quick takes. Hey, I think we might be entering home improvement season. With "only" three months until Pointy Bird's arrival, it's now or.....October 2015. Mas o menos. Something simple, like maybe painting the hallway? Brighten it up a bit? I don't know. Mostly I just want a whole new house, but apparently a few cans of paint is the cheaper option? Lame. Let's wrap this thang up with a little throwback to last summer. "HOLY SMOKES! LOOK AT THE COMPLETE LACK OF SNOW ON THE GROUND!" Everyone on facebook is saying I better not hear any complaints about the heat come August!! I totally read your first quick take as "I PEED myself." So I'm thinking, "okay, well, she IS pregnant, but that kind of seems like an odd thing to share.." Yeah. I had to go back and re-read that again. It's been a long day...I think I need some sleep. Or wine. (Definitely wine). Awww, that baby girl looks so warm...sigh. THANK YOU! Everyone always gets the sandwich analogy wrong! Today: You Win. Oh man, Cecilia is going to be the best historian ever! Love it. rio de janeiro, brazil: 35 celsius. or eveno more, some days, all day long. 35C = 95F. or even more. can we tilt the Earth a little bit so we have less temperature and you have more sun? "Theeeeeeeeee eeeeeeend." 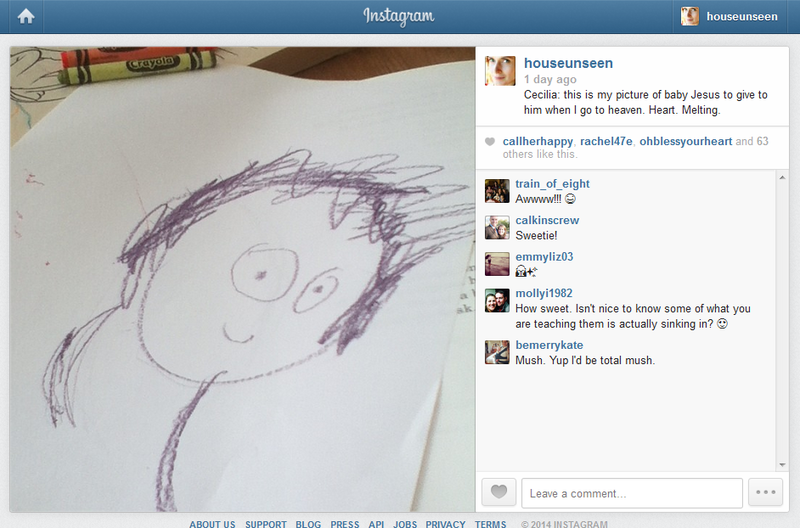 Sadly, Cecilia knows more about Church History than 99.9% of the population. And a roll of paper? That is an AWESOME idea. We've got a bit of the cabin fever here, yesmaamwedo. If I hear anyone complain about the heat this summer, I shall punch them in the throat. I just bought some paint so my husband can paint our hallway! I'm thinking having freshly painted halls that are free of hand prints, paint, applesauce, and boogers would be almost as good as a new house. My favorite is how birders associate a word or a phrase with a bird call to help identify it. 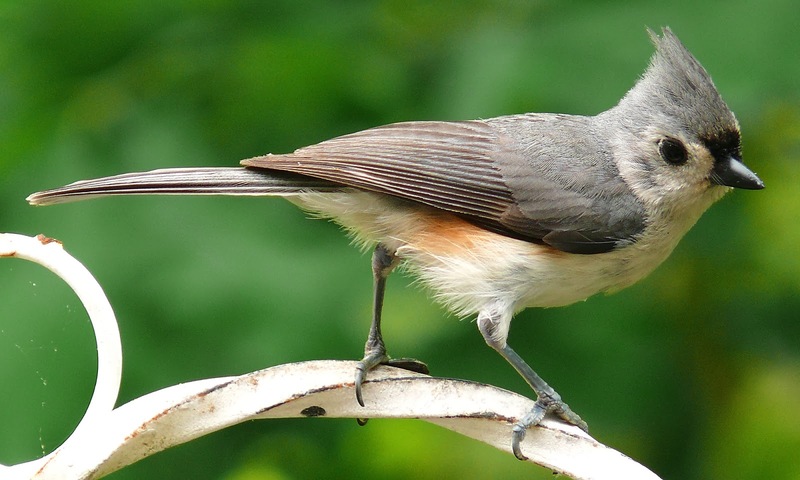 For example, your tufted titmouse says "peter-peter-peter!" Love the church historian's artistry, and now I want a giant roll of paper. Oh, and no snow. It's something negative here... I'm pretty sure it must be cold everywhere, even hell.